President Vladimir Putin has said Russia is worried about the escalation of conflict on the Korean peninsula. “If, God forbid, something happens, Chernobyl which we all know a lot about, may seem like a child’s fairy tale,” he said at the joint press conference after talks with Angela Merkel in Germany. Putin also hailed the US decision to postpone the planned nuclear missile test not to provoke Pyongyang. To prevent the disaster Putin has called on all sides for calm and to sit at the negotiation table to resolve all the conflicting issues. “Our position over North Korean nuclear issue is well-known, we are against the weapons of mass destruction,” Putin stressed. During his visit, Russia and Germany discussed trade. According to Putin, bilateral trade turnover might reach $100 billion soon. He also asserted Russia’s trust for the European Commission’s economic policy. “We wish success to our partners.. I do personally share her [Merkel’s] approach in solving today’s economic problems, including the Eurozone,” Putin said. During his two-day visit to Germany, Putin also took part in the wreath-laying ceremony in memory of the prisoners of Ahlem concentration camp, who died during the final days of World War II and in the opening of the annual Hannover trade exhibition. 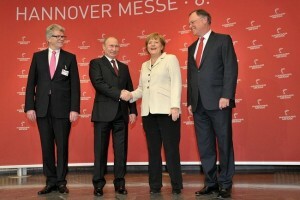 Putin opened the Russian pavilion at the Hannover Messe 2013 and toured the exhibition stands. The annual Hannover Messe is one of the world’s biggest exhibitions of the latest industrial innovations, where Russia is a partner country this year. Over 160 companies are taking part in Russia’s exhibition, presenting their latest advances in a broad range of fields including energy, energy- and resource-saving technology, transport, and the environment.